San Antonio’s East Side community was graced with some unforgettable performances, innovative pop-up exhibitions, and cutting-edge multi-media works at the ninth annual Luminaria Contemporary Arts Festival. In this episode of ARTS, we give you an in-depth look at how the idea was inspired by other popular international night festivals found in Paris and Madrid and what it means for the expanding artistic community in our city. Proposed in 2008 by former mayor Phil Hardberger, Luminaria’s purpose was to reimagine ordinary spaces found in historic downtown San Antonio and provide them as a creative hub for regional and international multi-genre artists to display their art. The idea was to make San Antonio known as an art city, deeply rooted in diversity and culture. The beginning stages of Luminaria were a growing curve for the art festival. Straying away from the original idea of arts in the streets, the event remained stationary at Hemisfair Park for a few years. 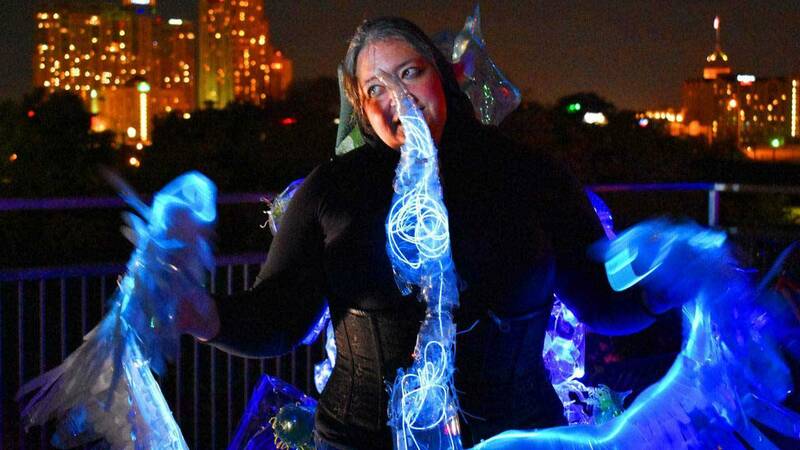 Wanting to stay true to its roots, Luminaria returned to the city streets in 2014. The move once again allowed participating artists to transform familiar sites into innovative and thought- provoking creative spaces, unimagined to the general public. This year, the artists highlighted the historical East Side with vivid art installations, multi- faceted light projections, extensive murals, and numerous spoken and live performances were among other visionary innovations. Iconic staples within our city such as the Hays Street Bridge, Carver Community Cultural Center, and the Dignowity and Lockwood Parks were reimagined by artistic works by talented artists for four nights from Nov. 9- 12, which included a series of events starting with a mural unveiling gifted to the community, and ending with a closing party in celebration of the nights the San Antonio skies glowed with art. Catch this episode of ARTS airing Thursday, Dec. 1 at 8 p.m. on KLRN.